Card Text Play: Destroy an enemy creature and a friendly creature. You may repeat this effect as many times as you like, as long as it is possible to repeat the entire effect. 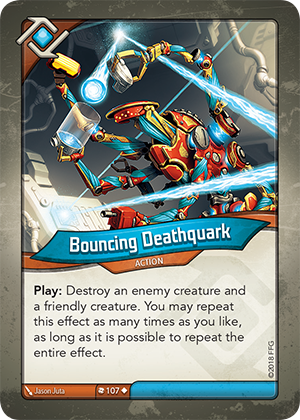 Does the Rule of 6 apply to the effects of Bouncing Deathquark? No. The Rule of 6 applies to playing or using the same card (by title) multiple times. Therefore, this effect is not limited by the Rule of 6.